I bought my iPad about two and a half years ago, not long before my last trip to Australia. It was the perfect solution to hauling half a dozen cheap paperbacks across the globe and discarding them in a series of airports and hotel rooms. It saved me the dismay of discovering that I was somewhere (like the airport in Broome) with nothing to read and precious little to select from the racks of a tiny shop. It was also an easy way to carry a small reference library of art images around with me, and to take photographs of work that we encountered and were considering for purchase. Since then I’ve also saved a small fortune in postage by acquiring a surprising range of history, anthropology, and Aboriginal fiction and poetry titles for the iPad’s Kindle app (and let’s not talk about shelf space in my office). But lately there’s been a new dimension added to my Aboriginal iPad experience with the emergence of a small group of Aboriginal apps. The first one I downloaded was a rather modest thing: a children’s book/game called Ngurrara: a Ngarluma Story by Tyson Mowarin. It’s a tiny graphic novel that tells three hunting stories. In the first, a young boy, Mararra, is taken out hunting for kangaroo for the first time. Shown how to creep across the rocky country, he makes his first kill, and afterwards scratches a record of it onto the stones. A clever bit of animation provides the transition across thousands of years and the melting of the ice caps; freshwater country becomes salty, and our young hero catches his first turtle. Once more he inscribes the story in the land. A thousand more years pass and the young man is now taken past the mines and the railroads to Murujuga, the oldest and biggest rock art gallery in the world, where his father shows him the ancient inscriptions that teach the meaning of ngurrara: we were always here. A clever bit of programming then provides the reader with a rocky “canvas” that can be inscribed tracing one’s finger across the surface of the iPad. Three different “stones” (or “brushes” in Photoshop-speak) allow control of the size of the marks made on the rock face; a handy undo feature provides flexibility that is a boon to a fledgling artist like me; and the resulting images can be saved, posted to Facebook, or sent to iCampfire.tv. The whole thing is neatly executed and plenty of fun. The second app I bought was more serious in nature. Yugambeh, produced by the Yugambeh Museum, Language and Heritage Centre in Beenleigh, Qld, is an iPad and iPhone app that contains over 1,000 common words in the language of the Yugambeh region, which includes the Gold Coasat, Scenic Rim and Logan regions. The app is based on a 1913 word list compiled by John Allen, or Bullumm, and an English teacher named John Lane. The Museum’s Director, Rory O’Connor, realized that the Museum had a unique resource in this wordlist, and that its utility in reviving language would be greatly enhanced if people could easily carry it around with them at all times. And thus, an app was born. A final section provides links to the Museum’s website and store, to its Facebook page, and to a handful of YouTube videos. 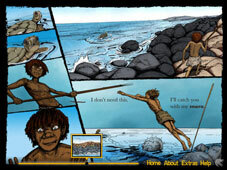 Yugambeh is also available on the Android platform. The Art Gallery of New South Wales has released a series of apps highlighting different parts of its collection, including Contemporary, Australian, and the one I have been looking at, Indigenous Australian: Art Gallery of New South Wales. This free app holds a lot of promise, but its initial release is, I have to confess, slightly disappointing. The app looks rich with features. You can browse the works by artist, by work, by date, by location (via a map), or by “favorites” once you’ve tagged the work as such from the individual page devoted to it. 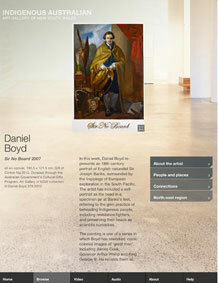 These individual pages feature a zoomable, high-quality image, physical details, provenance and acquisition information, and a link to the main AGNSW website page about the work (which often contains far less information than the app itself does). A menu offers a brief statement “About the artist” and may link to other examples of her work. 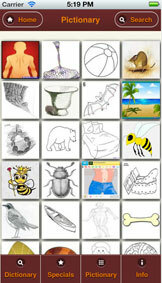 A link called “Connections” sometimes provides access to a similar work in the app’s collection. For example, the page devoted to Ken Thaiday’s elaborate Beizam (shark) dance mask (1996) sends you off to Esme Timbery’s shell construction of Sydney Harbour Bridge (2002), an artist who also “uses diverse and unexpected materials in her work.” From there, you can find connections to work by Yvonne Koolmatrie, John Mawurndjul, and Pedro Wonamerri, who all, we are told, also source their materials seasonally. There is, however, no link back to Thaiday’s “unexpected” materials. Another menu offers a choice of five short videos, mostly clips from the Hetti Perkins/Warwick Thornton series art + soul. Unfortunately, they’re not working on my iPad; after a few minutes an error comes up that ultimately links to YouTube. I can’t find any of these videos available on YouTube now, so I suppose that explains the problem. The audio clips, embedded in the app, do work, although there are only three of them, mini-lectures by Hetti Perkins on Emily Kam Ngwarray, Yvonne Koolmatrie, and Ricky Maynard. And that points to the major weakness of the app, in what I hope is simply an early release: there are only fourteen works included. In addition to the artists I’ve already mentioned, Daniel Boyd, Roy Kennedy, Patrick Mung Mung, Ivy Pareroultja, Ronnie Tjampitjinpa, Judy Watson, and Barrupu Yunupingu are represented. Given the stunning richness of the AGNSW’s historical collections, I had hoped for much more. The Gallery’s online website showcases 1,829 works from its Indigenous collections, including 618 with images. Perhaps as the app is updated, we’ll be treated to more. The final app I want to highlight today is One Road: Canning Stock Route Project. Based on the interactive display created for the National Museum of Australia’s Yiwarra Kuju: the Canning Stock Route exhibition, the One Road app is such a treasure trove of material that it’s hard to know where to begin describing it. The basic display is a map of the CSR that allows you to scroll its the entire length . Each of the 51 wells is represented by a small circle. Tap that circle and a picture of the well as it appears today pops up in a new window, along with basic information ranging from latitude and longitude, Aboriginal name, historical name, water quality in 1906 and today, and the Native Title area. Scrolling left and right brings in additional photographs or short video clips. Other similar circular icons add snippets of history. Near Well 36 a series of panels tells of the Locke Oil expedition. In 1922 an altercation between three surveyors and a group of Indigenous men left John McLernon dead at Lipuru. Photographs of McLernon and his grave are supplemented by photographs of Martumili artist Nora Nangapa, who tells a story of a similar (or the same?) confrontation that she grew up with, and recounted during the CSR expedition in 2008. Also near Well 36 is “painting story” presentation in which a series of videos document the collaborative execution of two paintings–men’s and women’s–depicting the Country from Wells 33 to 38. In the men’s painting, artists from five art centers work together as Jeffrey James calls out the names of the waters they paint. For the women’s painting, three sisters from Martumili Artists paint the Seven Sisters story at Kilykily. Other videos focus on the techniques used in creating the paintings and on images of the country as reflected in the work. Nearby on the map, another icon marked “paintings in this area” offers an in-depth look at eleven canvases, including the men’s collaborative. The documentation provided for this work includes commentary from the artists and documentation of each man’s contribution to the work. Another painting in this section is Hayley Atkins’ naive composition documenting both the trip itself and the painting of the women’s collaborative of the Seven Sisters story. Atkins shows the women sleeping in their swags in the bush, with a dingo for company, and the Seven Sisters shining brightly in the night sky above. More detail about the Seven Sisters is found behind another, nearby icon where photographs of the night sky are set along with painting documentation and Curtis Taylor’s video in which he tells the story of Nyiru’s pursuit of the sisters. Apart from providing all this historical and cultural information, the One Road app is meant to aid the traveler who wishes to journey through this country. Icons bearing the universal symbols for a campground indicate suitable locations for overnighting, including the availability of water. Other sites are marked where camping is specifically prohibited. A Google-Maps-like pin marks areas where other services are available. For example, at Kunawarritji, basic information is offered on fuel, the store, accommodation, and other services. Information about the community itself notes that the population is approximately 70, that no permit is required to visit, and that no liquor is allowed in the community. E-mail, phone, and fax details are provided as well. And just in case you’d like to watch the videos while you’re on your trek along the CSR, the option to download 2.2GB of data is provided at the main menu, along with the useful and money-saving tip to try this from a wi-fi (rather than a cellular) connection. The menu also gives useful information on first aid, on responding to emergencies, and treatments for everything from burns and scalds to snake bites. Another section describes how to prep your vehicle for the journey in terms of basic equipment and tools, recovery equipment, and communications planning. 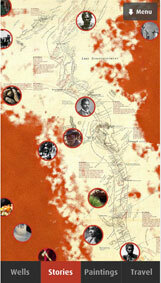 It also offers information on obtaining necessary permits and a brief essay on respecting cultural sites and artifacts. If you’re not planning to take this app on the road with you, or don’t have an iPhone or iPad, you can still enjoy its riches via the Canning Stock Route Project Digital Futures site, which offers links to a web app version of the interactive map as well as access to the MIRA Canning Stock Route Project Archive. Finally, there are some very nice animation effects in the mobile version: as you scroll around the map or watch your video, you may be startled at first to discover a thorny lizard or a rainbow serpent wriggling along on the sand behind the text you’re reading. And if you’re like me, and you’re enjoying this wonderful app in the shade of a big old tree, don’t worry: the ants crawling across your screen are animations too! At least, they have been every time I’ve noticed them so far. I hope you can enjoy sampling these apps, and invite you to share any others that you know about. This entry was posted in Art, Books, Culture and tagged Canning Stock Route, Exhibitions, Fiction, Games, iPad, iPhone, Language, National Museum of Australia, Yugambeh. Bookmark the permalink. Thanks for the post Will, I’m rushing off to get the Canning Stock Route one to complement the Yiwarra Kuja catalogue. The problem with the videos in the AGNSW app might be dreaded copyright, they work fine for me here in Oz. The other apps that spring immediately to mind are the NATSIAA apps. NATSIAA 28 is still available, 29 appears to have been withdrawn or replaced by 30. NATSIAA 29 was replaced by 30: given the long turnaround time for approval for apps from Apple, they had to “update” 29 with 30’s content to get it out in a timely fashion. Apparently, each new year is considered a brand new development by Apple. I’ve been all-Apple all-the-time since 1987 and my first MacSE, but my patience is starting to wear thin.